Haggerston is a neighborhood in the London borough of Hackney, which is classified as one of the most deprived areas of the UK. It is also a rapidly changing area as property values rise in conjunction with the “regeneration” of East London, especially since the 2012 Olympic Games were hosted very nearby. 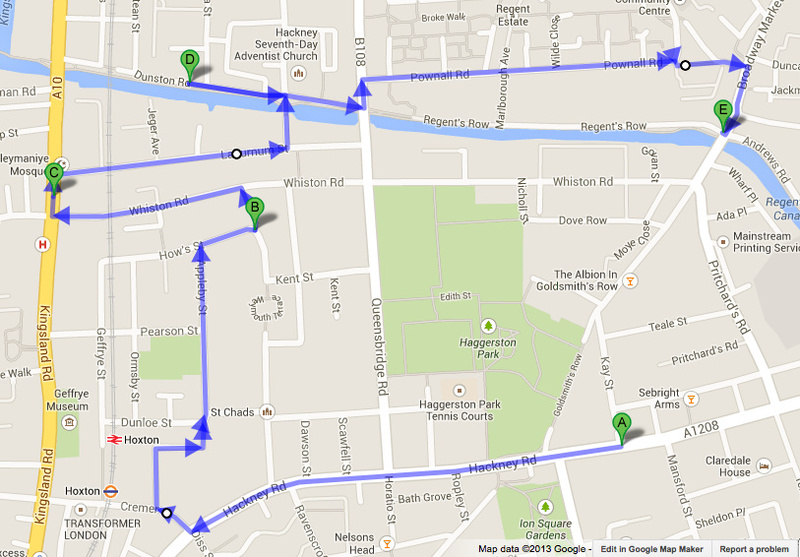 This walk was a preliminary mapping exercise that is part of a university project centering on East London. The London boroughs are huge and so this did not necessarily cover that much ground, but there were still many observations to be made. Most of my Hackney knowledge thus far is based around Hackney Road, which bustles with the sounds of cars, buses, the occasional siren. Veering away from there, however, I was surprised by just how much of Hackney seems to consist of housing. There are a large number of council estates (Britain’s form of social housing), but these have turned increasingly into privately-owned flats in recent years. Hackney was part of London’s urban sprawl in the 19th Century, home to a growing working class that fueled the city’s industry. Hints of the area’s history and current “regeneration” are quite evident when walking around, especially as estates and buildings with boarded-up windows, along with construction sites, are commonplace. Right on the border of Hackney and Tower Hamlets, this old children’s hospital has been set for demolition and much of the community is in disagreement about the housing development that is to replace it. Walking down Hackney Road, the border street between the boroughs of Hackney and Tower Hamlets. The shell of a building, common sight in the area. Barrier hiding construction on southside of Hackney Road. A brand-new estate agent’s office. Street art on Cremer Street. The overground near Hoxton Station, opened in 2010 to connect Hackney to South London. Leaving the noisy bustle of Hackney Road, Appleby Street is utterly silent. I come across a community garden. Following the sound of a crane at work, I come across a major site of redevelopment in the area. The future “City Mills” will consist of privately-owned apartments. Playground with demolishing buildings behind. Flyer posted in the playground. Though I don’t know for sure, the planned apartments are unlikely to be affordable for working-class Londoners. “Regeneration” means mobility and better connection to London’s commercial centers. A “revived” community…is the current one passed out/dead? Süleymaniye Mosque, opened in 1999, on Kingsland Road. Built with Turkish funding, it includes a function hall, a school and a canteen. On the other side of the future City Mills site, Laburnum Street. Haggerston Baths, which have been long closed. The building was supposed to re-open as a community pool but hasn’t due to lack of funding. A newer building on Queensbridge Road, apparently a mix of private and socially-rented housing, as well as workspaces. Regent’s canal, which was a commercial waterway until 1950. An abandoned warehouse with the new boat-like structure of Bridge Academy behind. The school, built in 2008, has won awards for its design, which attempts to provide adaptable classrooms and to deter bullying. An abandoned lot on Dunston Road. The Haggerston Estate, which has been due for redevelopment for a few years. An artists’ collective has put up photos of former residents over the boarded windows. Another angle of the estate with another City Mills site in the background. A football field off Pownall Road. Broadway Market, an increasingly gentrified street, where a number of business owners have had to close up shop and move elsewhere.